MBLWHOI Library » WHOI Technicians who were women processed hydrographic data 1940's-'50's informing WWII North Atlantic operations. WHOI Technicians who were women processed hydrographic data 1940's-'50's informing WWII North Atlantic operations. 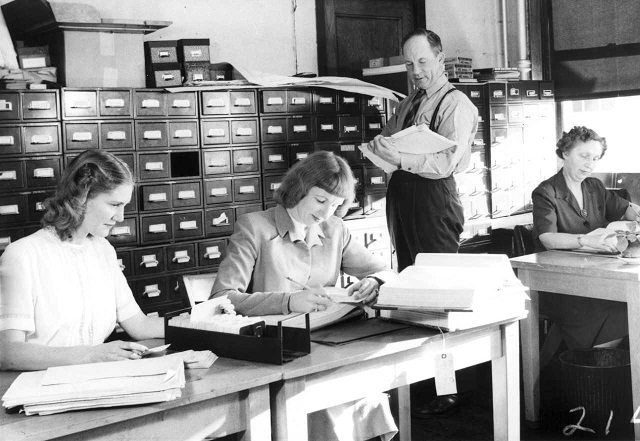 (above) L-R: Esther Wilson, Eileen Bergstrom, Gloria Gallagher, & Arnold Clarke filing BT cards in Bigelow bldg. Photo courtesy of WHOI Archives. Copyright © Woods Hole Oceanographic Institution. 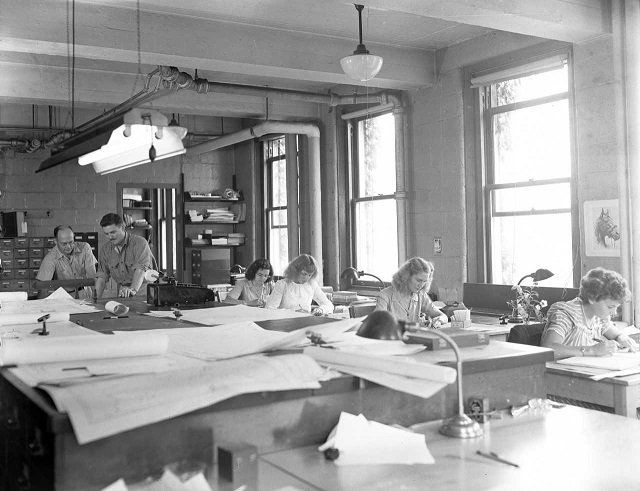 From 1941 until the late-1950s, a team of women working at WHOI built and maintained a library of hydrographic data that was ultimately critical in mapping the North Atlantic. At the beginning of World War II, the U.S. Hydrographic Office set up a program using WHOI’s resources to collect and process data from bathythermographs, or BTs, (oceanographic instruments that recorded water temperature and pressure at different depths) and organize them into a library of data that was used to create maps of the ocean. Any organization was eligible to send data to the program provided they obtained the BT observations using U.S. Navy specifications. A number of agencies and organizations sent data, including the U.S. Navy, Coast Guard, Hydrographic Office, U.S. Fish and Wildlife Service, English ships and various companies and universities. The BT data came to WHOI in the form of small, smoked glass slides with a line etched into the coating representing the temperature and depth readings. A group on the third floor of the Bigelow building, supervised by Elizabeth Diaco, received from 2000-5000 slides per month (by 1951, about ten years after the program started, nearly 190,000 BT and Nansen bottle observations had been processed and cataloged). Diaco’s team (which over the course of the years the project operated included Jean English, Harriett Crandall, Marion Crocker, Dorothy Douthart, Gloria Gallagher, Doris Holmes, Eileen Scharff, Evangeline Tollios, Alberta Silva, Esther Wilson, and Mary Williams) analyzed and cataloged the slides, a process which included plotting the path of the vessel and the position of the individual BT observation, creating graphs of the temperature at the surface and at different depths, noting salinity levels and other data, and copying the information from the slide on to cards for the library of data. Finally, photographic prints of the slide and graph were created and copies of the prints were filed both in the repository at WHOI and at the Hydrographic Office in Washington, D.C. Three members of the team, Diaco, Scharff, and Tollios, also traveled to Washington for three months in 1948 to help set up the slide library at the Hydrographic Office. (above)WHOI employees process hydrographic data, (L-R) Louis Post, Val Worthington, Patricia Brown, Eileen Scharff, Gloria Gallagher, and Doris Lumbert. Photo courtesy of WHOI Archives. Copyright © Woods Hole Oceanographic Institution. When the project began in the early 1940s, the main purpose was to create charts to help the war effort, but after the war, the extensive amount of data processed by the team was combined with other pre-war temperature observations and used to study seasonal thermal cycles. Physical oceanographer Fritz Fuglister, who was in charge of the processing and analysis of data, used the data from Diaco and her team to study the relationship between temperature distribution and currents, and in particular to track the course of the Gulf Stream. These studies had practical value for subsurface navigation and for commercial fisheries and other industries. A number of charts of the North Atlantic, including Fuglister’s three dimensional model of temperature distribution in the Western North Atlantic, were also created using the BT data. The importance of the project was also illustrated by the fact that WHOI started planning longer cruises around the time specifically to fill in gaps in geographic and seasonal coverage of the observation data. Processing the slides was a monotonous, time-consuming procedure, with the average time per slide taking 6.8 minutes, but in 1956 John Stimpson devised a new method of producing the BT cards. Along with project supervisor Elizabeth Schroeder, Stimpson refined the process to cut down on the time and production costs. The new ammonia vapor reproduction process tripled the output of cards produced to about 1000 per day, and also made it easier to produce new copies of an individual card if needed. The new process also had the advantage using the same cards as the original process, so that no changes in the filing and storage system were needed. The increase in productivity also meant that fewer people were needed to process the data, so the project staff was reduced over time as the new procedures were implemented.